Not able to afford internal polling and taking the wrong stands on most of the issues prevalent to conservative Republicans, Senator McCain has just made his biggest comeback since 2000. He’s decisively done it again, but I hope (with all of his well known superstitions aside) that we don’t repeat 2000 and a better funded candidate gets the best of him late in the other primary states. Bringing us back down to earth, however, McCain has probably the worst chance if Obama wins the nomination. In September and October, you and I will be looking at a 72 year old man battling a surging, intelligent young African American riding high on the hopes and dreams of more people than we can probably see in these early primary days. And I’ll call you John, even if your supporters are screaming “Jack is Back”. 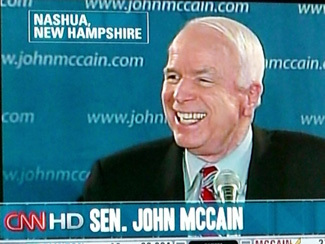 Though, suddenly they’ve switched to a simple “John McCain” chant. And now, “USA, USA, USA”. I wish I were there and not just sitting in my living room listening to this antiseptic speech. I might enjoy the great advantage this entire New Hampshire trip has given you. Wow. Johnny B. Good. Nice choice.